If news reports and leaked emails are to be believed Tesla recently achieved a burst build of 1,000 Model 3s in a day and the company is trying to sustain production at that level. I’ll put it out there. Confirmed. I received the same email at nearly 1am PST time. Converting production bursts into sustainable weekly production capacity is easier said than done. Despite achieving a burst build capacity of 5,031 Model 3 units in the last week June (Q2-2018), Tesla struggled to maintain a weekly production rate of +5,000 units in the third quarter of 2018. But historical data shows that Tesla has tasted some success in the past in making that transition. In the fourth quarter of 2017 Tesla’s burst build capacity was 793 units. The electric car maker went on to build 9,766 Model 3s in the following quarter, a weekly average of 768 units. Tesla did a little better in the second quarter, averaging 2,224 Model 3 units per week, slightly better than the 2,020 unit burst capacity the company reached in the last week of the previous quarter. The only anomaly was the third quarter when Tesla’s weekly production average was 4,095 units, nearly 1,000 units less than the burst build capacity of 5,031 units the company reached at the end of the second quarter. A quick look at Bloomberg tracker shows that Tesla’s production rate plunged in late September. Did Tesla slow down Model 3 production in the third quarter? 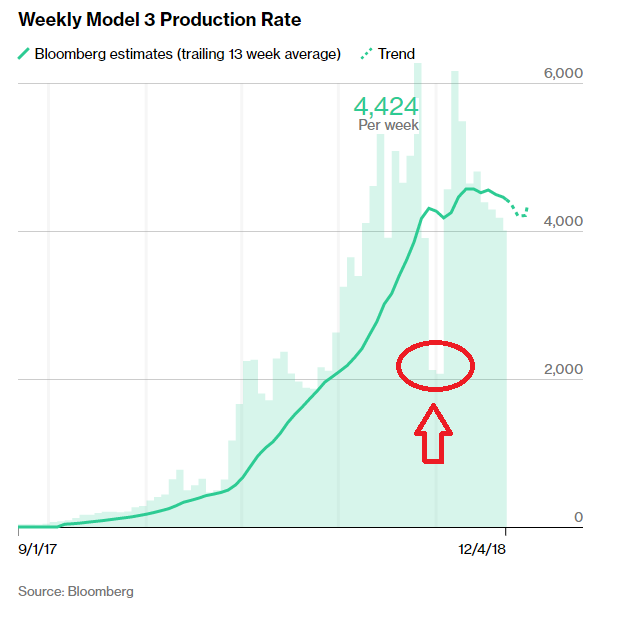 The drop in production can be further validated using Tesla’s monthly US sales estimates. After reportedly selling a massive 22,250 Model 3 units September, Tesla’s deliveries dropped to 17,750 units in October. Tesla faced plenty of production and delivery issues in the third quarter of 2018. To name a few, the electric car maker dropped some of the paint options to streamline production and took help from volunteers to help deliver cars in September. 29 Sep 2018: Huge thank you to all Tesla supporters for helping with car deliveries all around the world. You rock!! 17 Sep 2018: Sorry, we’ve gone from production hell to delivery logistics hell, but this problem is far more tractable. We’re making rapid progress. Should be solved shortly. 11 Sep 2018: Moving 2 of 7 Tesla colors off menu on Wednesday to simplify manufacturing. Obsidian Black & Metallic Silver will still be available as special request, but at higher price. With delivery becoming a considerable bottleneck, Tesla may have pulled back on production and used the downtime for process improvement. Data collected by Bloomberg tracker shows Tesla’s production improved in the fourth quarter. According to Bloomberg, Tesla has built 42,286 Model 3s in the first nine weeks of the current quarter, a weekly average of 4,698 units. If Tesla has reached a burst build capacity of 1000 units per day as reported by the media, Tesla will exit the fourth quarter with a weekly model 3 average production rate of more than 5,000 units – effectively converting previous quarter’s burst build capacity to current quarter’s average weekly production capacity. Since Tesla has successfully transitioned burst build capacity to sustainable weekly production capacity two out of three times in the past, the odds are quite high for the company to do the same in the fourth quarter as well as in the first quarter of 2019. The financial impact of Tesla reaching a weekly average of 7,000 Model 3s and 2,000 Model S and X will be huge. A production rate of 9,000 units per week translates to nearly 117k units per quarter. Tesla has already achieved a gross margin of more than 20% on Model 3. As volume increases Model 3 margins could further strengthen. 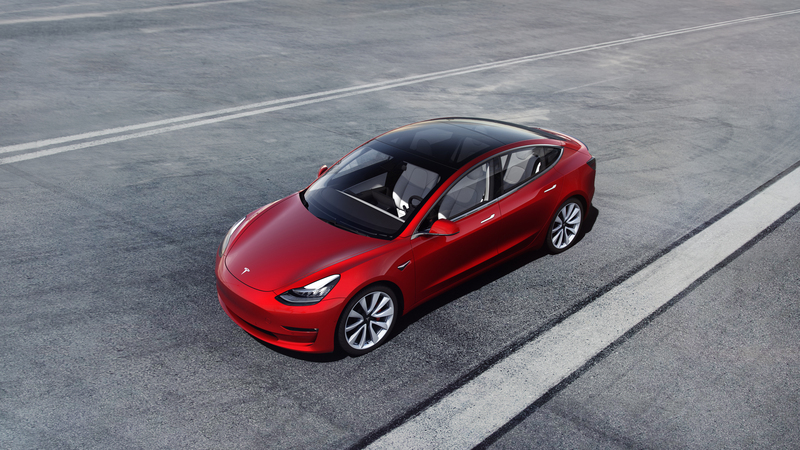 If Tesla manages to deliver more than 90,000 Model 3s in the first or second quarter of 2019, at an average selling price of $50,000 the company is looking at nearly $4.5 billion in revenues. If gross margin stays in the 20% to 25% range, Tesla will be generating gross profits of $900 million to $1.125 billion from Model 3 alone. It is worth noting that Tesla’s operating expense was just $1.106 billion in the third quarter of 2018. A production rate of 7,000 Model 3s per week is not just a statement on Tesla’s production capacity but it will have a significant impact on Tesla’s financial strength.